Okay, the government has promised a Clean India by 2019. And it has asked corporate groups to pitch in. It’s not a random mandate, by the way. Contributing to Swachh Bharat Abhiyan qualifies as legitimate corporate social responsibility (CSR) spend as per the country’s famous CSR law (Section 135 of Companies Act, 2013). One of the targets of the campaign is to provide rural India with more than 100 million toilets over the next five years. While this number may be met due to the scale of the efforts taking place (the government claims to have constructed around 80 lakh countryside toilets across India), there are concerns regarding quality, sustainability, and even demand for using these toilets. Over 560 million people in India still practise open defecation, which is more than half the global total. This, according to WaterAid UK Annual Report 2013–14, results in the deaths of about 186,000 children annually in India due to diarrhoeal diseases primarily caused by unsafe water and poor sanitation. To gauge the programme’s success rate, the union ministry of drinking water and sanitation — the nodal agency for the ‘rural’ part of the cleanliness campaign — engaged National Sample Survey Organisation (NSSO) for an impact-assessment study. Sources in the ministry said that one of the most common complaints coming from states like Uttar Pradesh (UP) was the lack of acceptability and proper usage of the toilets built in remote rural areas. Now, this is an obstacle that many may not have foreseen. Everybody was so focused on the physicality of the problem that the mindset aspect by and large escaped notice. Every second, or third, corporate entity seems to be out there building one toilet after the other, giving us a dazzling array of numbers – 1,000 by the next fiscal, 10,000 by the end of three years, and so on. If not for the fact that many of these toilets are lying unattended/unused (and face a future wherein they may end up being something else entirely), one will be with great hopes of a cleaner and saner tomorrow. So, here we are, just over a year after the launch of the Abhiyan. Puzzling over the finer details of a mission that captured corporate budgets and media fancy, and not to forget, the peculiarities of the subjects of that mission which left many experts baffled. Call it soul searching, toilet surfing, assumptions churning, or whatever else you may. There is no escaping the lessons that must be grappled with and the actual challenges that must be taken head-on. Some like to use it. Some don’t. For Bharti Foundation, currently working to improve sanitation facilities in rural Ludhiana, the main challenges have been: a) ensuring quality construction of a large number of toilets and b) the identification process to decide on the correct beneficiary. To tackle the first challenge, the Foundation has been carrying out sample checks, sample audits, and education of beneficiaries, and for the second, it has engaged with the sarpanch and the community to attain transparency in selection. How successful these approaches are will have to be seen when realistic impact assessments are done a few months down the line. Soni agrees that the Swachh Vidyalaya programme concentrated more on toilet construction while giving the maintenance aspect the short shrift. TKM, he says, is working towards achieving sustainable maintenance and focussing on behavioural change communication to ensure larger change amongst children and school teachers. For Swades Foundation, the strategy has been two-pronged: one, extensive engagement with the communities they work with, and two, building so-called aspirational toilets. Community engagement has ensured high awareness and demand for an open defecation-free (ODF) environment—and hence regular usage. Many communities have imposed fines on open defecation only to find that the collection of fine is nil. The programme also envisages that resource-poor private schools catering to education beyond Class 7 will have separate toilets for boys and girls by end of FY 2015–16. To generate awareness, Swades Foundation also ran a campaign called Swachhta Rath, a toilet prototype mounted on a vehicle that went from hamlet to hamlet persuading people to end open defecation and adopt good sanitation practices. Over a period of 45 days, this rath travelled to all the villages in the six blocks of Raigad. In addition, community mobilisation teams organise monthly village meetings to review if toilets are being used properly and to advocate good sanitation habits. Village health workers called SwaRaksha Mitras go door to door to teach hygienic practices. 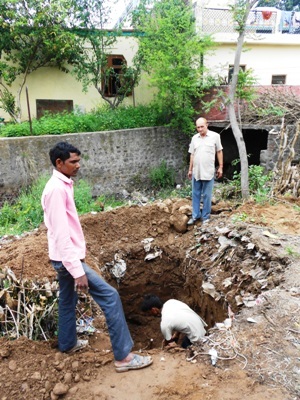 A village sanitation committee is entrusted with the responsibility of monitoring the proper use of toilets. For its Satya Bharti Abhiyan, an initiative to improve sanitation facilities in rural Ludhiana, Bharti Foundation has been running sanitation awareness campaigns led by students in the villages where Satya Bharti Schools are operational. These students are reaching out to community members to explain the benefits of hygiene and the usage of household toilets. The goal is to eventually reach out to several villages in the vicinity in collaboration with government schools and other partners. Bharti Foundation claims to have committed an investment of Rs 100 crores to be spent over the next three years in over 900 villages across rural Ludhiana. This will be utilised for the construction of toilets in individual households lacking such facilities and for improving sanitation facilities in government schools by building new toilets for girls. The Foundation is partnering with various organisations for the construction of these toilets. 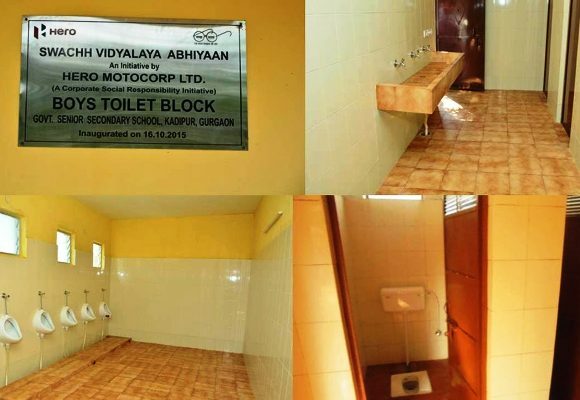 The company has so far handed over more than 50 toilets to schools around their manufacturing units, including in Gurgaon, Sidhrawali, and Akera, in Haryana; Kheldi in Haridwar, Uttarakhand; and Neemrana in Rajasthan. About 100 more toilets are in various phases of readiness. Affirming that their sanitation initiatives are ‘an intrinsic part of Dabur’s CSR policy,’ A Sudhakar, head – global human capital and CSR, Dabur India Ltd, says that they have gone through a process of detailed consultations with the community. Their programme, 700 se 7 kadam, seeks to protect the dignity of women in rural India by bringing toilets closer to their homes. At one level, the programme aims to provide financial support for construction of household and school toilets; at another level, it seeks to reinforce the message about ‘hygiene’ through awareness campaigns in schools, slums, and public areas. 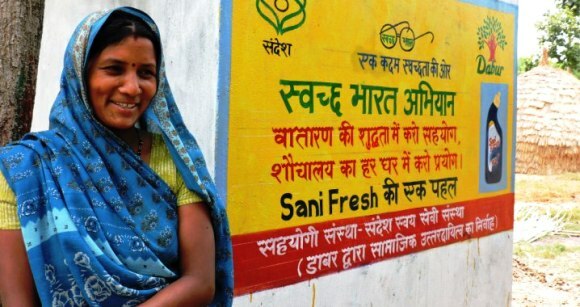 Dabur has selected 12 villages in rural Ghaziabad (Uttar Pradesh), 5 in Rudrapur (Uttarakhand), and 2 in Baddi (Himachal Pradesh) to implement the sanitation-focussed programme. The overall target is to make these villages open defecation-free, with toilets in every household and in every government school in the next three years. As per the data available on these villages, nearly 50 per cent of households did not have individual toilets. 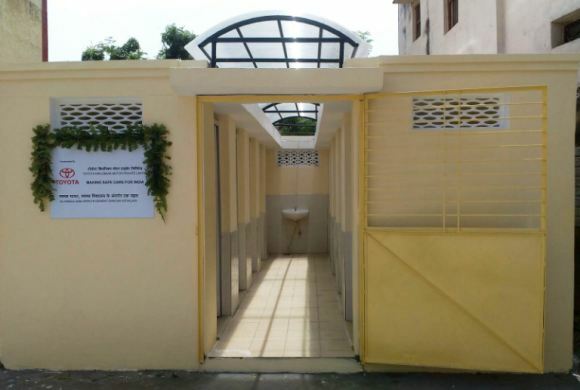 As of now, Dabur does not see any drawback in their programme and while they are not immediately looking at any new partnerships (the company is implementing and monitoring this project through its CSR arm Sustainable Development Society [Sundesh]), they are willing to explore association options for maintenance of the school toilets. As for the toilets in individual households, their maintenance is the responsibility of the respective households, which the company hopes will make the project sustainable in the long run. Sundesh representatives organise meetings with the villagers to motivate them to adopt clean hygienic practices. In fact, once a toilet is constructed, a relevant ‘sanitation’ message is painted on the wall to serve as a constant reminder. Going somewhat Dutch has been the modus operandi of Swades Foundation too – they (and their partners Tata Trust, Reckitt Benckiser, Coca-Cola, etc.) have been footing about 80 per cent of the total construction cost of a toilet, leaving the rest 20 per cent to the household. The cost of building a toilet, in their own words, ranges between Rs 23,000 and Rs 25,000. All this is fine and while the team at Swades believes that their model is completely replicable, they admit that the biggest challenges at the moment are in scaling up, finding the right and cost-effective technologies, and finding right vendors for execution. TKM’s Soni says that they will measure the impact of their Swachh Vidyalaya programme in terms of these aspects: a) behavioural change amongst children; b) less school dropouts due to lack of sanitation facilities, especially for girl children; and c) greater degree of readiness in the community to build sanitation facility at household level. With an expansive budget of Rs 35 million, which they mean to spend within this year itself on building 500 toilets for girl children (125 in Varanasi, Uttar Pradesh, 125 in Vaishali, Bihar, and 250 in Ramanagara in Karnataka), the impact assessment will be worth watching out for. Interestingly, Toyota will take care of maintenance of all 500 toilets for one year. Behavioural change takes many years and needs committed and sustained engagement, especially when it is about changing behaviours that have been around for decades. And sanitation is primarily a behavioural issue, to be undertaken by people themselves for their own good. The role of government, corporate entities, and development organizations is only to facilitate this positive change by providing infrastructure and incentives and assisting people. The past year and some months have seen a massive mass media campaign unfurl across India urging people to keep their surroundings clean and build toilets in their houses. This has been reinforced by local information, education, and communication material produced by the government and various civil society organisations extolling the benefits of building and using a toilet. Some change is happening for sure, but it is as yet unclear if such efforts have managed to change people’s attitudes and approach to sanitation. For reasons best known to them, so-called champions of the campaign like Mahindra Group decided to not divulge details about their programme (despite Chairman and MD Anand Mahindra declaring a grant of Rs 30 crore to construct 5,000 toilets, at the NDTV Cleanathon—but of course that was on national television). We only hope it’s got nothing to do with their commitment to the larger cause itself—or a lack of understanding about the real challenges and impact to be targeted/measured. For the record, some other companies that did not respond to CauseBecause’s queries were: Maruti Suzuki, Gail India, IndusInd, Apollo Tyres, and Hindustan Unilever.